6:30-8:30PM MONDAY, JUNE 11 Writing Workshop | Michael Stackpole: 7 Steps to A Great Novel Michael Stackpole ﻿﻿﻿New York Times bestselling author Michael Stackpole (At the Queen's Command and I, Jedi) lays out seven critical steps to creating a great novel. ﻿You'll get everything from characterization techniques and story recipes to practical advice on how to write quickly and well, minimizing rewrites and maximizing sales potential. Stackpole covers methods important to stand-alone novels and series, genre fiction, and general fiction. These are the practical steps Michael himself has used to create manuscripts that sell! Cost: $25. Registration and pre-payment: 480.730.0205. Michael Stackpole signs At the Queen's Command. Michael A. Stackpole , I, Jedi. 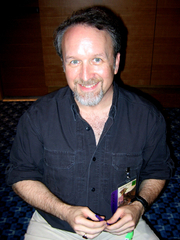 Michael Austin Stackpole (born November 27, 1957) is an American science fiction and fantasy author best known for his Star Wars and BattleTech books. He was born in Wausau, Wisconsin, but raised in Vermont. He has a BA in history from the University of Vermont. From 1977 on, he worked as a designer of role-playing games for various gaming companies, and wrote dozens of magazine articles with limited distribution within the industry. Michael A. Stackpole is currently considered a "single author." If one or more works are by a distinct, homonymous authors, go ahead and split the author. Michael A. Stackpole is composed of 14 names. You can examine and separate out names.